I purchased 3 of these rugs in grey and love the way they look- great purchase!!! Soft, versatile color and a plush yet durable weave are the highlights of this handmade area rug. Natural wool fibers are woven by hand for a tight pile that delivers instant warmth to any space. I found this rug after having purchased a rug 2x as expensive from another site that took 3 months to deliver. I got fed up waiting and by chance found this option. I ended up getting them on the same day (the other was delivered a few weeks earlier than expected), so I unrolled them both to compare. Although you could see that the quality of this rug was not quite as fine as the other, but the difference was not noticable at a glance. This rug has a beautiful weave; it is chunky, but not so much that it destabilizes furniture. The color is a warm white, not too bright. It adds a touch of warmth and luxury to my otherwise modern, more severe, decor. It is easy to vaccuum. I am extremely happy with it. This is a very nice rug! The wool is clean and tightly woven. The braids are larger than they appear in the picture, but are very cool. This rug is comparable to high-end retailer selections at half the price. I purchases the Premium hardwood carpet pad and it completes the look and feel. Trimming the rug pad allows the corners to lay flat. Because of the light color - I purchased white which is a very warm eggshell color. I applied scotch guard and there was no discoloration. This is a very nice rug and looks beautiful on oak floor! This rug is found elsewhere for 2-3 times the cost at Overstock. It is off-white cream color, no grey hue. We use it at our beach house and get many compliments on its knotted style. It sheds only slightly. I didn't give it 5 stars only because the dimensions are not exactly 9x12. Mine is more toward 8.10 x 11ish. It is actually longer on one side than the other. Since it is under a sofa it doesn't matter. It does have some give in it so if I pulled it, it may stretch . I fear doing that may make the knots look strange so I am leaving it as it is. I really love it though and it feels soft underfoot. 3/2018. I am updating this review because I have owned this rug for almost three years and it still looks great. Also, it definitely shedded more in the beginning than any other rug I’ve ever owned. But that ends after maybe two- three months. It may be annoying to deal with but the shedding never diminished the integrity of the product. It’s a very nice rug. Love this rug. We ordered the cream/off-white version. The color is exactly what we expected and the quality is great. Found it on overstock for a fraction of the price as elsewhere. 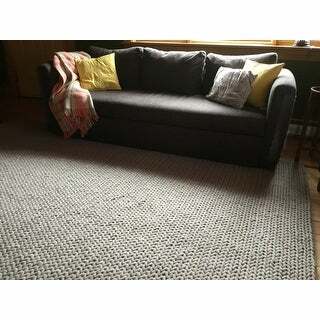 Originally found this rug on ***** and was surprised to find it larger and about $250 cheaper on overstock. We've already had to deal with pet urine stains (new house, he's usually quite good) and the rug is very absorbent. I would say if you're concerned about staining don't get this rug. We used a couple of different cleaners to attempt stain removal and they haven't worked, which is not typical. The fibers rub off on your clothing too, kind of like a how a dog sheds so if that's a concern to you beware - we're pretty laid back so it doesn't bother us. Such a nice rug . 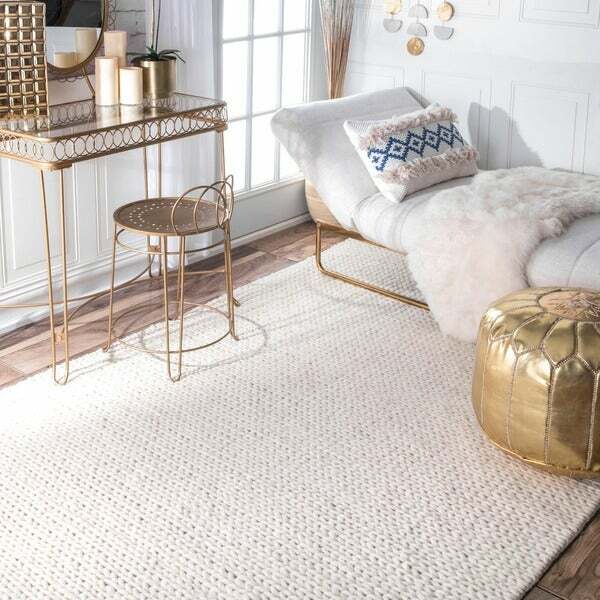 Feels good under your feet , and the color is soft and pleasing I purchased all together five of these rugs of different sizes and they are all very serviceable and practical items . I do recommend the Non slip pad for them like any thinner rug . We think there great little braided rugs . Good product . Purchased this rug for our nursery. We wanted something really soft and warm with a high pile - this rug fits the bill perfectly! The cable-knit weave is unique and gives it such a wonderful feel. We just put the rug in so I'm not sure how well it holds up to vacuuming or traffic with a dog, but right now we're very pleased. In terms of color, we ordered the light grey and it is a little more "flat" than I thought. Based on the photo I thought it might be closer to a heathered grey with darker and lighter fibers woven in, but it's truly a very pure, flat, grey color. Very pretty, just a little deceiving based on the online photo. Overall, very pleased with the purchase so far! Falling apart and unbraiding rug! Unfortunately, this rug started coming apart on us as soon as we vacuumed it the first time. It's almost as if the braided part has been glued down and it comes up when vaccumed. At 1st, we thought it would just be in a few places and that we could glue them down with a hot glue gun, but then we noticed that almost every time we vacuum, a new braided part becomes undone and starts sticking up and straight out of the rug. Looks really bad. We tried all 3 of our vacuum cleaners on it, and it happens with all of them. Have talked to Overstock customer service reps a few times already, uploaded and sent pictures and are still waiting for someone to email/contact back. I hope they will do something for us, because in a few months I am afraid that most of the rug will unbraid. Very unfortunate since it was quite expensive and looks very nice. This is overall a great rug! We bought it for our toddlers room and liked it so much we bought it again for another home. Its a neutral color - off white with a hint of very light grey undertones. It doesnt need a rug pad underneath as its quite heavy. It shed a bit in the first few weeks, but with regular vacuuming, it stopped after a couple of months. Definitely recommend this. One thing to note is that the braids are quite wide/chunky. In the picture they look to me a bit thinner, so if that's an issue for you, do note that before you buy. Interesting - Natural - Artsy- the presence of eye catching texture with a modern almost Scandinavian feel adds instant personality. The pets took to it immediately! Nice comfort to the touch. The gaps between the braids will collect debris - expect to vacuum this rug (like any other). It's well made and quite unique. The braiding is not perfect - it is hand made- so there are natural variations in the rows - gaps do widen and narrow which tells of its handmade origin. I wonder if in years to come the braids will loosen- they seem quite secure tho - so I will treat it with care. Purchased this rug in October 2016, and I'm very happy with it. Love the thick weave and that it is wool. The grey color we purchased is perfect for our living area. The rug is durable and easy to clean even after I spilt a whole cup of coffee on it last week eeeek !!! ( no stain!) Sheds a little but not to bad at all, I highly recommend if your in the market for a wool braided rug. I did not expect to fall in love with this rug. But it's extremely well made, contemporary, and feels outstanding on bare feet. It also manages to work with our grey couch (a real risk, I felt, when ordering). I would buy this again in a heartbeat. Nice rug but cheaply made. It's been about 6 months since we have had this rug and it has the knots have started to come apart in several places. Looked good when we got it, but the quality seems pretty poor. This rug looks great but us impossible to vacuum and the glue that hold the braids in place have detached. So I have random pieced oh yarn sticking up in various places. I have had to stop using it. So this is the most expensive rug I have ever purchased. I usually go cheap. But I just couldn't resist the knitted look of this rug. I was worried to purchase it online, but it looks even better in person. The rug is really a creamy white and it looks perfect against out maple floors. It really gives our living room and warm and cozy feel that I was looking for. Couldn't be happier with this purchase. Overstock provided fairly quick shipping and the rug was packaged very well. I would buy this again in a minute. The concept of the rug is nice but this one is poorly excecuted. The wool sheds so much we had tumbleweeds rolling through our house. The color is a nice cream but the loops are somewhat irregular leaving the rug pattern looking inconsistent. Not worth the price for the quality. Would buy it all over again. Super soft area rug and everything about it is great. We got the beige color and it is so beautiful. The rug is gorgeous but I took a star off because mine came with one of the braids was messed up. Also the braids are pretty thick (it’s lifted off the rug about an inch) so in between each braid there is space for crumbs to collect. ***** UPDATE ***** Don’t waste your money on this. The braids comes undone. I’ve had this rug less than a month and already the braids are comfortable no off. Also, it’s not actual braids. It’s pieces glued down to look like a braid. Very disappointed. Looks great on my hardwood floor. I purchased this rug for my nursery as we just couldn’t swing the ones at ***. I love that it’s natural and after a few months, it’s holding up great! Quality did not disappoint! I purchased this rug in both grey and natural thinking one would go back depending on which color we liked best. We loved them so much we kept them both! We wanted a thinner pile and this is just the right thickness for us. Some natural fiber rugs are too thick, this one is absolutely perfect. Item is just as described! High quality braided rug with tight knit. Nice color/sheen. Expect it to last for quite some time! Would suggest getting it for yourself!-Update...in a matter of weeks with light use it is a real mess...getting fuzzy and a piece of a braid unattached itself and sticks up. Don't buy! The rug is soft and feast quality. The off-white color is soft and warm. Happy with this purchase! Gorgeous rug with stylish texture. This rug could easily sell for % more through major furniture retailers, and people are always surprised when I tell them it's from Overstock! "Is the off-white available in the 6x6 square size? When I put it in my cart, it shows up as the 8' runner"
Yes this is available in a 6 x 6 square rug. "Is this rug returnable if it doesn’t look right in the room?" "Does Overstock offer a warranty on this rug?" No, there is no warranty for this rug. "Would this rug work well under an office chair with wheels?" Yes, this rug would work well under an office chair with wheels. "What is the chair/chaise lounger in the picture?" "is the white color is white or more off-white?" "Does anyone have that has this rug in the family room, have dogs? Worried about their nails snagging the loops. Thank you"
We have this rug in our living room with 2 large dogs, we have not had any issues with snagging. However, pet stains are extremely hard to get out of this rug.